Growth hacking is one of the favorite buzz phrases of tech startups these days. Many of us have already heard about how growth hacking is essential for startup businesses to embrace and apply to acquire users. But there's nothing magical about it. Read on to learn how you can use some of the strategies employed by several social media and tech companies (like Facebook, Twitter, Instagram, Pinterest etc.) in the early stages of their launch to grow your user base. 1. Surround yourself with key people that believe in the product and have the skills sets that compliment both production and marketing. 2. Keep your business simple. Make it easy yo access and use. Find you "Aha" moment and discover what resonates with your customers to get them to keep coming back. 3. Make sure that any type of message or communication piece you have, has your website and an intriguing tag to it that makes a curious reader check it out. You want to create a viral loop that enables your users the ability to promote you without even realizing it. 4. Pick a target audience and then get friends to help you grow. Strive for high quality so that you become sought after and grow through references. 5. Create content including visual content that keeps your audience informed and builds a relationship. If you can establish trust, you will be able to convert followers into clients. 6. Every company starts at 0 clients. Figure out how to get potential clients by networking with groups and associations you respect and want to be part of. 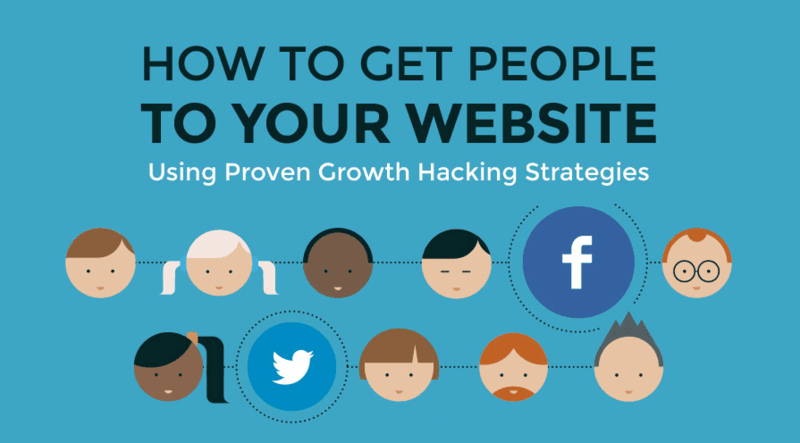 This infogaphic called "How To Get People To Your Website - Using Proven Growth Hacking Strategies" looks at some of the examples of large tech and social media companies that have used growth hacking to grow their business.